IMG_8896, originally uploaded by onebadapple. 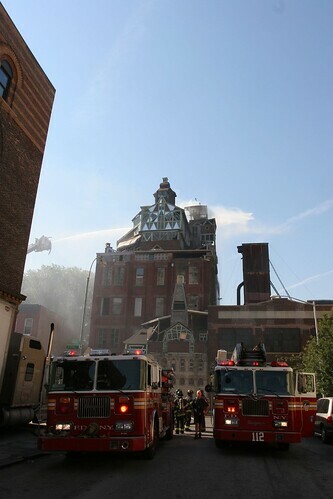 Gosh, lots has happened since Clinton Hill Landmark Broken Angel caught fire two weeks ago. First, owner Arthur Wood was dragged away in handcuffs, and now authorities are threatening to tear the whole thing down! It seems to have created quite a divide between residents -- those who think the building is an important artistic landmark, and those who are irritated that the Woods' were shoddy in their construction years ago and are rolling their eyes at the requests by the family for private donations. I'm kind of torn on this. I'm not a huge fan of the monetary plea, because really, they did kind of do this to themselves. If you've seen Chapelle's Block Party, you've seen how precarious the insides of the building are. However, I love the building, and I think it represents something unique in Clinton Hill. The Woods created something special in a downtrodden area years ago when not many would have taken a chance in the area, and the building and its owners have become real fixtures in the community. I don't think I'd send them any money -- hey, who has enough to go around these days! -- but I'd certainly provide my time, in the form of an afternoon here and there doing work inside. It could be a kind of "habitat for humanity" type project. I'm sure that comment will receive some flack, but Clinton Hill is all about being a neighborhood and I think it would be wonderful if area residents chipped in to help bring the building up to code. Think about it -- it could be a big BBQ/block party! I think the authorities have gotten a bit out of hand about it, and should be helping to come up with a solution. I'd think some sort of organization, artistic or historic, might be able to come forward with a grant? Anyway, that's my humble opinion. I can see Broken Angel from my window, and would be sad to see it go.